Were you previously using Roundteam to publish automatic retweets based on hashtags or keywords? Are you now looking for a Roundteam alternative due to the increase in Roundteam prices? If yes, you will want to continue reading! GroupTweet has been around long before Roundteam. We pride ourselves on our quick customer service and support. We are happy to have you try out our platform to get your automated retweets back up and running again. Additionally, we are happy to offer 15% off Roundteam pricing to anyone reading this blog post. Just email pricing@grouptweet.com with the Twitter username you wish to use with GroupTweet and we will get you setup. Automatically retweet a specific list of Twitter users when they send a Tweet containing any of your defined hashtags, keywords, phrases, or emoji triggers. Automatically retweet any user your account is following when they send a Tweet containing any of your defined hashtags, keywords, phrases, or emoji triggers. This is helpful when you have too many potential contributors to list. GroupTweet can be used in a number of different ways. For example, we don’t just offer auto retweeting. With GroupTweet, you can allow approved contributors to visit your GroupTweet dashboard and send Tweets from there, as well as reply to any incoming @mentions, search for other Tweets to retweet or reply to, and follow other Twitter users for you. 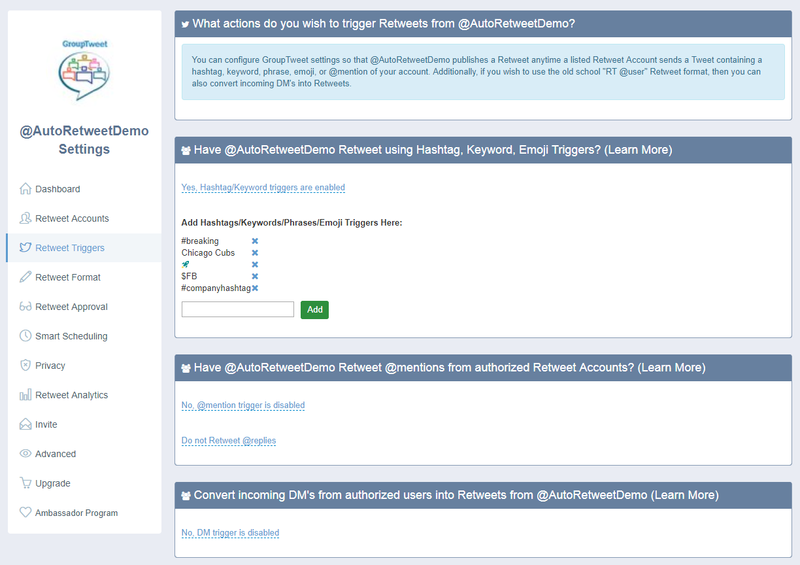 However if you are just looking to setup auto retweet type functionality then follow the step by step guide below. If you have any questions – don’t hesitate to email support@grouptweet.com or initiate a chat session in the lower right hand corner of GroupTweet.com. 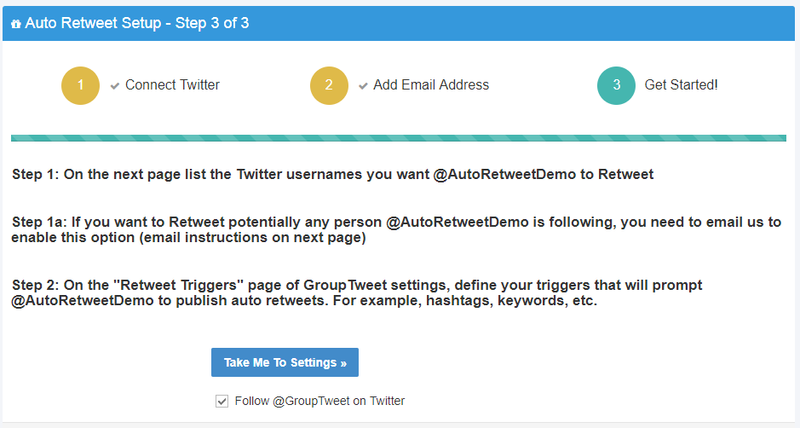 After adding your Retweet Accounts, you need to navigate to the “Retweet Triggers” menu of GroupTweet settings so you can define which triggers you wish to result in a Retweet from your account. As you can see below, you can configure your GroupTweet settings to that your account publishes a Retweet anytime one of your Retweet accounts sends a Tweet containing a hashtag, keyword, phrase, emoji, or @mention of your account. Additionally, if you wish to use the old school “RT @user” format, then you can also convert incoming DM’s into Retweets. GroupTweet’s auto Retweet pricing can be found here: https://GroupTweet.com/autoretweet/pricing. Prices range from $9.99/month to $24.99/month for an unlimited account. Find a lower price from Roundteam or elsewhere? Email us and we will beat it. Of course! We offer a free 7 day trial. No credit card required. No problem! Just send me an email, ryan@grouptweet.com, and I can help you out. Alternatively, you can visit GroupTweet.com and start an instant chat request (lower right hand corner) during normal business hours. Or schedule a time to chat on the phone as well here. How can I setup GroupTweet to work with multiple accounts? Just logout and follow the same directions with a new account. You will want to add your personal email as an “admin contributor” under GroupTweet settings. This enables you to login to GroupTweet.com with that email address in the future, and you will be able to manage all of your various accounts under a single login. We do offer discounted pricing if you activate more than 2 accounts with GroupTweet. Email us at pricing@grouptweet.com for more info. How else can I use GroupTweet? GroupTweet does much more than just help you auto retweet other Twitter accounts. With GroupTweet, you can allow approved contributors to visit your GroupTweet dashboard and send Tweets from there, as well as reply to any incoming @mentions, search for other Tweets to retweet or reply to, and follow other Twitter users for you. Check out other examples here. Visit http://grouptweet.com/autoretweet/instructions/wizard and connect the Twitter account that will be doing the retweeting. Hi Ryan, i tried it and it shows that its retweeting but why the retweets are not showing on my actual account on my app? Email support@grouptweet.com with your account info so we can investigate. If its retweeting, likely you have notifications blocked or disabled or something. No idea which account you are using with GroupTweet.